Natural Health News — Antibiotics aren’t the only drugs that can have a devastating effect on the gut microbiome. In a new study, published in Nature, German researchers with the European Molecular Biology Laboratory (EMBL) report that more than a quarter of the non-antibiotic drugs they tested – including acid-reducing medications, antivirals, blood-pressure medications, anti-psychotics and chemotherapy drugs – inhibited the growth of at least one strain of bacteria commonly found in the gut of healthy humans. Another worrying finding was that consumption of some non-antibiotics could promote antibiotic resistance. » German researchers testing the impact of non-antibiotics drugs on the human microbiome have found that a large percentage can affect the growth of healthy bacteria in the gut. » The researcher also found that that consumption of non-antibiotic drugs may promote antibiotic resistance. » These are serious and worrying findings given that as a population we take many non-antibiotic drugs – for example acid-reducing medications or blood-pressure drugs – often for long periods of time. Recently, a few commonly used non-antibiotic drugs have been shown to cause changes in gut microbiome composition, but the full extent of this phenomenon was unknown until now. The research team screened 1,079 drugs (156 of which had known antibacterial activity) on 40 representative bacteria from the human gut and monitored effects on bacterial growth. These non-antibiotic drugs tested were intended to target human cells rather than microbial cells, yet the scientists found that more than a quarter of the non-antibiotics (250 out of 923) affect the growth of at least one species in the gut microbiome of healthy individuals, including Escherichia coli, Bacteroides fragilis, and Clostridium difficile. The non-antibiotic drugs tested included drugs like omeprazole, a proton-pump inhibitor sold under the brand-name Prilosec; loxapine, which is used to treat schizophrenia; and metformin, an antidiabetic drug. The researchers suspect that the antimicrobial effects of some of these drugs, like metformin, could be directly related to their mechanism of action. Chemotherapy drugs, calcium-channel blockers (used to treat high blood pressure), and antipsychotics inhibited more gut bacteria than other medications. 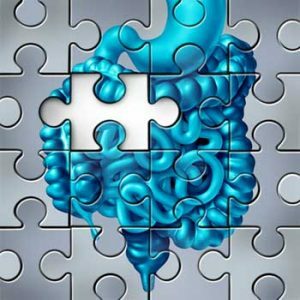 With some drugs, such as antipsychotics, the impact on gut bacteria could possibly enhance their therapeutic effect, the researchers say. Although the bacterial species’ susceptibility to the drugs varied, the researchers report that the species that are most abundant in the gut of healthy individuals were more susceptible, including species like Roseburia intestinalis, Eubacterium rectale, and Bacteroides vulgaris. “This suggests that human-targeted drugs have an even larger impact to the gut microbiome with key species related to healthy status,” the authors write. The researchers also uncovered a previously unnoticed risk; that consumption of non-antibiotic drugs may promote antibiotic resistance, in part because the general resistance mechanisms of microbes to human-targeted drugs and to antibiotics seem to overlap. Finding that there was a strong correlation between the bacteria that were resistant to antibiotics and those that were resistant human-targeted drugs, the researchers experimented with a strain of E coli that carries the antibiotic-resistance gene tolC, which produces a protein that flushes antibiotics and other chemicals out of bacterial cells. Strains of E coli in which this gene was active were resistant both to antibiotics and six of seven non-antibiotics tested, while E coli lacking the gene were more sensitive to both. This is a serious and worrying finding given that as a population we take many non-antibiotic drugs – for example acid-reducing medications or blood-pressure drugs – often for long periods of time. Doing so, say the researchers could promote antibiotic resistance by inhibiting susceptible strains of bacteria and allowing drug-resistant strains to flourish. “Taking into account that abundant members of the human gut microbiome are impacted more by drugs, one could speculate that pharmaceuticals, used regularly in our times, may be contributing to the decrease in the diversity of microbiomes of modern western societies,” the researchers conclude. Since only a fraction of the hundreds of bacterial species in the human gut were tested, the authors say the number of non-antibiotic drugs that inhibit bacterial growth is likely higher, which highlights the urgent need to examine the role that these drugs are potentially playing in microbiome-related diseases and in the global rise of antibiotic resistance.